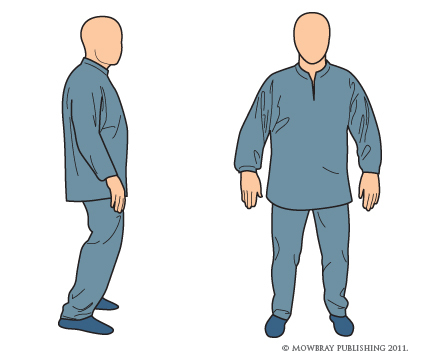 If time is limited, the following basic T’ai chi walking exercise teaches all the fundamental T’ai chi skills, including: bodily awareness, correct back alignment, rooting, sinking and balance skills, and the differentiation of substantial & insubstantial. It is in fact a complete set of T’ai chi exercises. With the feet just under shoulder width apart, and weight distribution at 50/50 on each foot, ensure the shoulders are relaxed and the head is straight but not held rigid. Keep a small space under each armpit, so the hands and arms are held slightly away from each side of the body. Bend the knees slightly to keep your stance relaxed. Using a slight leftward shift of the hips, move the weight more onto the left foot. This is as much an internal move as an external move so it is important to keep it small and especially keep the left hip joint aligned with the left knee and left foot. Feel the weight now fully on the left foot, and let the foot sink into the ground by relaxing the sole of the left foot. When you are fully rooted through the left foot and stable, slowly raise the right foot, with the big toe leaving the ground last. You should use the right lower back muscles and abdominal muscles to lift the foot, not the leg muscles. The leg muscles should remain relaxed. Keeping the weight sunk through the left foot, slightly ease the right foot forward, only a distance of 2 to 4 inches. Then lower the right foot, keeping the leg muscles relaxed. The heel contacts the ground first, then the rest of the foot. Pause in this position. Do not shift the weight onto the right foot yet. Both feet are on the ground and the right foot is slightly forward. Then slowly and very carefully shift the weight forward onto the right foot. This is achieved by a slight forward movement of the hips. It is a controlled slight forward movement, and should not be exaggerated or it will disturb your balance and root. Feel the weight fall through the right leg and through the foot into the ground. Ensure that the right hip, knee and foot are aligned. The left foot should now feel weightless. The actual forward movement with this step is very small, only 2 to 4 inches. All the important movement is in the hip shifting. When you are fully rooted through the relaxed right leg, use the left lower back muscles and abdominal muscles to slowly raise the left foot. The forward step is again very small and totally controlled. You should be able to pause at any point and hold the position. No weight is placed on the left foot until it is fully lowered and you have paused and then shifted the hips forward slightly. When you train T’ai chi walking, remember the slowest and most controlled walker is the one who wins.